It’s fair to say I’ve enjoyed the journey as much as the destination. 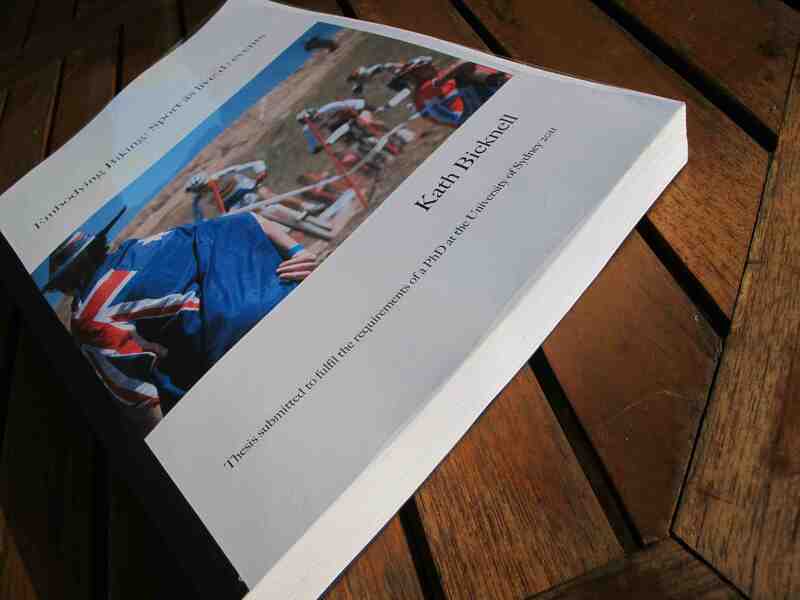 My PhD thesis, “Embodying Biking: Sport as live(d) events”, looks at the relations between thinking, doing and riding. What I’ve really enjoyed about the work is that when most people read it, or hear about it, they relate stories about riding to activities from their own world: running, theatre, medicine, music, F1, surfing, dancing, climbing, kung fu, writing, painting… Depending on who I talk to, the way I describe this work bends toward the interests of who I’m talking to as well: it’s about why the fastest looking legs on the start line aren’t always the first across the finish line. How staging one event, or funding one group of riders, has impacts on a wider, riding community. Through studying audiences at mountain bike events, it helps us make sense of spectators’ experiences in situations when verbal interaction is not the done thing. It’s about moving. Fast. And how we guide and understand those movements as they happen. And it’s a set of ideas that I hope to develop more in the future too, doing other projects, with other people. Thank you to numerous people for their support. Particularly my partner, family, supervisors, other staff and students at the University of Sydney (especially those in Performance Studies), coffee buddies and members of the Australian and New Zealand mountain biking communities. The marking process takes a few months, but if you’re interested to read some shorter articles, exchange ideas or see the project in it’s current form, please get in touch. In the short term, I plan to write more stories and wear out more pairs of knicks. *Most numbers, including this one, are approximations.